An Extract of Reflection: Index to the Prerogative Wills of Ireland, 1536-1810. The wills in Ireland may be said to consist of two classes, Prerogative and Diocesan. Those proved in the Prerogative Court are the most important, containing, as they do, testamentary demises from all parts of Ireland, and generally referring to the more important members of the community. They commence in 1536, and continue to 1858. Before 1857 wills used to be proved in the Consistorial Court -- that is, the Court of the Bishop or Ordinary within whose diocese or jurisdiction the testator dwelt -- but if there were effects to the value of £5 in two or more dioceses the will had to he proved in the Prerogative Court of the Archbishop of Armagh, Primate of All Ireland, which was the Supreme Court in matters of which the ecclesiastical jurisdiction had cognisance. The Consistorial Courts dealt with the assets of deceased persons who were domiciled in the diocese, and had no personal estate outside of it. As the number of wills proved in the Prerogative Court increased considerably after 1810, it was thought better not to continue the Index further. Classification of Wills in Ireland in Public Custody. Prerogative wills, 1536-1858, deposited in the Public Record Office, Dublin. Diocesan wills, 1536-1858, in Public Record Office. Unproved wills, dealing with real property only, from 1708, at Registry of Deeds, Henrietta Street. Wills from the Inquisitions -- Henry VIII. to George I. -- Public Record Office. A few very early wills in the Royal Irish Academy and in Trinity College Library. Further and full information regarding Irish wills may be found in "A Supplement to 'How to Write the History of a Family,'" by Phillimore, 1896. The book under review contains upwards of 40,000 names of deceased testators. 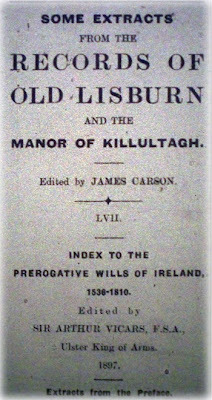 All those connected with Lisburn, Hillsborough, and Ballinderry have been extracted and recorded here. A number of other names of possible local interest are also given. The genealogist, however, in search for information, is referred to the volume itself, which may bo seen in any of the large public libraries. 1799 Jane Agnew, Mossvale, Co. Down, widow. 1767 Richard Archbold, Esq., Lisburn. 1793 Richd. Barnesley, Lisburn, merchant. 1786 Elinor Barton, Lisburn, spinster. 1786 Henry Bell, Lisburn, linen draper. 1746 Robert Bell, Lisburn, merchant. 1760 Susanna, widow of R. Bell, Lisburn. 1726 John A. Bernicre, Lisburn. 1790 Henry Betty, Lisburn, linen draper. 1682 Capt. Lancelot Bolton, Lisburn. 1790 Jas. Boyes, Stoneyford, linen draper. 1697 Randall Brice, Lisburn, Esq. 1791 Eliza. Bridge, Plantation, spinster. 1702 Arthur Brooke, Lisburn, surgeon. 1695 Francis Brooke, Lisburn, M.D. 1672 Ay. Bunting, Ballinderry, yeoman. 1810 Hy. Burdon, Lisburn and Calcutta. 1788 R. Burden, Lisburn, linen draper. 1679 Captain John Byron, Lisburn. 1767 Mary Campbell, Ballinderry, alias Haddock. 1789 William Carleton, Parish of Blaris. 1707 Henry Charters, Lisburn, merchant. 1784 Thomas Clark, Ballinderry, gent. 1706 Humphry Clarke, Ballinderry, gent. 1742 Henry Close, Plantation, farmer. 1781 William Close, Plantation, gent. 1632 Edward Conway, Viscount Killultagh. 1732 Francis Conway, Viscount Killultagh. 1737 Daniel Cormier, Lisburn, gent. 1801 Wm. Coulson, Lisburn, linen draper. 1737 Alex. Crommelin, Lisburn, gent. 1756 Anne Crommelin, Lisburn, widow. 1743 Samuel L. Crommelin, Lisburn, gent. 1788 Isaac Davis, Ballinderry, farmer. 1775 Samuel De Lacherois, Hilden, Esq. 1637 Marmaduke Dobbs, Lisnegarvie, gent. 1775 Rev. Richard Dobbs, D.D., Lisburn. 1802 John Douglas, H'borough, merchant. 1719 William Dynes, Mullacartan, gent. 1750 Wm. Fairlie, Lisburn, gent. 1744 Jeremy Falloon, Ballinderry Hotel. 1804 Jane Fletcher, Lisburn, widow. 1727 Eliza. Forbes, Ballinderry, widow. 1800 Edward Gayer, Derriaghy, gent. 1755 Rev. Philip Gayer, Derriaghy. 1690 George Gregson, Lisburn, merchant. 1742 Thos Gurnall, Plantation, malster. 1718 Catherine Hackett, Lambeg, widow. 1707 John Haddock, Carranbane, gent. 1785 Rev. Isaac Haddock, Hillsborough. 1772 James Hall, Ballinderry, farmer. 1763 Jacob Hancock, Lisburn, merchant. 1757 John Handcock, Lisburn, merchant. 1784 John Handcock, Lisburn, merchant. 1774 John Hastings, Lisburn, merchant. 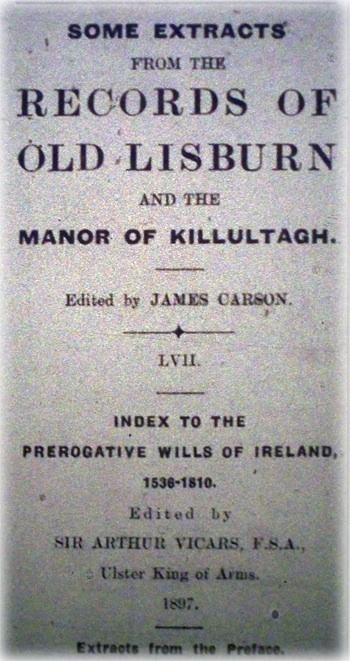 1809 Samuel Heron, Lisburn, attorney. 1780 Rev. Thomas Higginson, Ballinderry. 1665 Arthur Hill, Hillsborough, Esq. 1699 Michael Hill, Hillsborough, Esq. 1682 Moses Hill, Hill Hall, Esq. 1693 William Hill, Hillsborough, Esq. 1775 Sarah Hodgkinson, Lisburn, widow. 1781 James Hogg, Lisburn, merchant. 1773 William Hogg, Lisburn, merchant. 1667 William Hoole, Lisburn, gent. 1723 Anthony Hopes, Ballinderry, farmer. 1690 Jennett, widow of Wm. Hull, Lisburn. 1690 William Hull, Lisburn, gent. 1771 Jas. Hunter, Lisburn, linen mercht. 1794 John Hunter, Lisburn, Esq. 1710 Michael Jackson, Lisburn, gent. 1734* Michael Jackson, Lisburn, gent. 1804 John Johnson, Lisburn, Methodist preacher. 1709 Isa. Johnston, Lisnetrunk, widow. 1711 Jane Johnston, Lisburn, widow. 1779 Conway Jones, Lisburn, M.D. 1780 Mary Jones, Lisburn, spinster. 1761 Valentine Jones, Lisburn, Esq. 1789 Rev. Frans. Jonston, Tullycross. 1791 Elizabeth Kennedy, Lisburn, widow. 1769 John Kennedy, Lisburn, merchant. 1738 Margt. Leatnes, H'borough, widow. 1723 Murdock M'Call, Derriaghy, tanner. 1811 John M'Dowell, Lisburn, tobacconist. 1807 Edw. Magennis, Lisburn, merchant. 1796 Henry Marmion, Lisburn, gent. 1707 Wm. Muslin, Lisburn, innkeeper. 1720 Arthur Maxwell, Drumbeg, Esq. 1757 Hamilton Maxwell, Drumbeg, Esq. 1682 James Maxwell, Drumbeg, gent. 1794 Bryan Mercer, Hillsborough, gent. 1799 Wm. Montgomery, H'borough, Esq. 1775 Jas. Moorhead, Milltown, linen draper. 1797 Thomas Morris, Lisburn, Esq. 1780 John Mussen, Lisburn, apothecary. 1690 Isabella Mussenden, H'borough, wid. 1728 Thomas Oates, Lisburn, surgeon. 1790 Edward Obre, Lisburn, Esq. 1665 John Olphert, Lisburn, quarter-master George Rawdon's troop. 1716 Edward Peers, Lisburn, Esq. 1789 Edward Peers, Lisburn, brewer. 1701 John Peers, Lisburn, gent. 1691 Sir Henry Ponsonby, Hillsborough. 1684 Sir George Rawdon, Lisburn. 1743 Philip Robinson, Lisburn, merchant. 1726 Lewis Rochett, Lisburn, merchant. 1785 Thomas Seeds, Lisburn, gent. 1774 Andrew Shanks, Lisburn, merchant. 1690 Ralph Smith, Ballymacash, gent. 1730 Mary Smyth, Lisburn, widow. 1714 Patrick Smyth. Lisburn, gent. 1736 Ralph Smyth, Lisburn, Esq. 1781 Joseph Speer, Lisburn, merchant. 1772 William Spence, do., linen draper. 1759 Henry Stanhope, Legmore, gent. 1709 Richard Swinerton, Lisburn, gent. 1766 Adam Tate, Sprucefield, linen mercht. 1667 Jeremy Taylor, Bishop of Down. 1692 Mary Thelwall, Hillsborough, widow. 1745 John Towle, Hillsborough, gent. 1767 John Usher, Aghalee, linen draper. 1798 James Waddell, Springfield, Esq. 1703 Godfrey Walker, Mullacarteen, gent. 1627 James Walshe, Castle Robin, gent. 1729 Anthony Welsh, Lisburn, gent. 1757 John Wolfenden, Dunmurry, gent. 1743 Richard Wolfenden, Lambeg, linen draper. 1777 Richard Wolfenden, Lambeg, mercht. I, Captain Lancelot Bolton of Lisburne, in the County of Antrim, being sick and weake of body but of sound memory and understanding, do hereby make my last will and testament in manner and form following, and trusting through the merits of Jesus Christ to be saved. I commit my soul to Almighty God, my Creator, and my body to be decently buryed as either of my Executors shall think meete. Imprimus -- I will that all debts justly due by me be first paid, with my funerall expenses. Item -- The surplicsage and remainder of all my Estate, goods and chattels, movable and immovable, reall and personal, leases, debts due me, arreares of pay, and all other my Estate whatsoever belonging to me, I give to my Exors. hereafter named, to be by them distributed and disposed of to my brother, Capt. Richard Boulton, and my sister, Anne Webster, as my Exors. in their discretion shall think meete. Item -- I do humbly request and do hereby nominate my very good Lord, the Right Hon. Edward Earle of Conway, and my very good friend Richard Mildmay, Gent., his Lordship's receiver, Exors. of this my last will. Will signed 23 Aug., 1682. The will of Lancelott Boulton, late of Lisburne, County Antrim, Esq., was proved by Richard Mildmay, one of the executors named, having the right of the Earl of Conway, 14th November, 1682. * The date printed in the Lisburn Standard was 1743. After a check of the original this was proved to be 1734. Thanks to Sharon Oddie Brown for highlighting the error. In Remembrance - "The Winners"